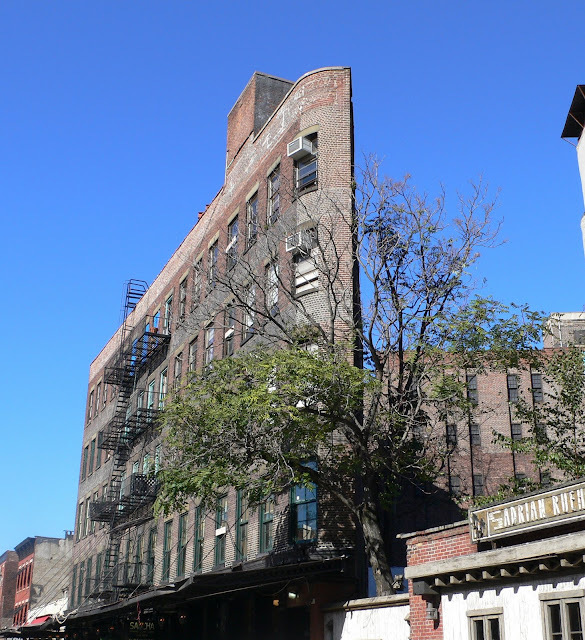 My try at shooting this wafer thin, elegant bldg in the meatpacking district. And Bernice Abbott's famous shot from 1936. The master lives! I've always loved this building so much! Your shot is gorgeous, Ken. Wow...what an amazing building! Amazing photography, too, of course! It's curious how in 1936 the tree wasnt there. Usualy is the opposite! Amazing building, Ken! Love both pictures! What a strange building! Is it really that thin or is it just the angle? It looks like an old movie set where they just had the front facade and behind it something propping it up. I want to see another angle so I can "get it". see ya later alligator. I'm off to Paree! Gosh, what can you have in rooms that narrow? That is so amazing! I'm with Hilda. Any way you can get a shot of the inside on the top floor? lemme break in! Someone asked if this is an allusion, the building is actually that thin at one end. There are others like that in town, most notably the Flatiron building. Thanks for the nice comments everyone! I stand by my request. Any way you can get us a peek at the inside of one of the thinnest rooms? As only Ken Mac could do? and it looks like the signage from the old photo is gone. Is that so? hey, if you're revisiting abbott pics with new shots, i'm very excited by the idea...hope you do more! it's a very good perspective ...If this building is so thin how thin are the occupants? the vote is in, I have to sneak in the building and shoot those small rooms, and do more before and afters revisiting the master Bernice Abbott. Fun!